Charlie Daniels returns to his bluegrass roots on his latest project, 'Joy to the World: A Bluegrass Christmas,' which also features the Grascals, Jewel, Aaron Tippin, Dan Tyminski, Kathy Mattea and Suzanne and Evelyn Cox of the Cox Family. The two-disc set includes a 10-song CD and a DVD of live performances as well as Charlie interviewing his special guests about their Christmas traditions. "I cut my teeth on bluegrass music," says the North Carolina native. "The first band I played in was a bluegrass band. I've always loved bluegrass music and wanted to do this project. One of the aims that I had by doing it was try to do some songs that would not be ordinarily thought of as bluegrass. For instance, 'Christmas Song,' which Dan Tyminski did such an incredible job singing. If you hear Nat 'King' Cole or Mel Torme sing it, I don't think you would think of it as being a bluegrass tune." Yet on 'Joy to the World,' Charlie and friends put a bluegrass spin on such holiday favorites as 'Blue Christmas,' 'O Come All Ye Faithful,' 'God Rest Ye Merry, Gentlemen' and the album's title track. "I'm a big fan of these people," he says of his special guests. "I enjoy hearing them perform. So standing there listening to Kathy Mattea sing or the Cox sisters, it's a big joy to me." 'Joy to the World' marks the first time Charlie had worked with Dan Tyminski. 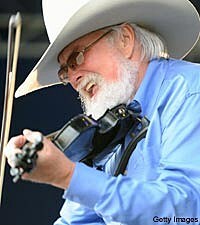 While Charlie had initially recruited bluegrass legend Mac Wiseman to sing 'The Christmas Song' on the album, fate intervened. "I'm a big Mac Wiseman fan. I love Mac, and I had in my mind a vision of Mac Wiseman singing 'chestnuts roasting on an open fire,'" Charlie says. "Between the time that we actually got the track done and it was time for him to do the vocal, he had a terrible accident and was almost bed-ridden for a little while and just wasn't able to record the vocal. I had this beautiful track with twin fiddles. One of my dreams was doing the 'Christmas Song' bluegrass style, so I was stuck." The suggestion of bringing in Dan, who's a member of Alison Krauss' band Union Station and also leads his own award-winning group, led to one of the album's standout tracks. "He came and did it and he just killed it," Charlie says. "He's such a tremendous artist. He made no big deal out of it and it's a hard song to sing. I do it in my show every year. I do it in a different key and I don't do it bluegrass style. I just do it kind of pop style, but he just walked in and sung it. He's a tremendously nice guy and I'm really happy to have him be a part of this." 'Joy to the World' also includes two recitations. Charlie delivers a heartwarming reading of the Christmas story from the Bible found in the book of Luke and also serves up 'A Carolina Christmas Carol,' taken from a book of short stories he penned a few years back. When asked how he and his guests got in the holiday spirit when filming the DVD last summer, Charlie laughs and says "We turned the air conditioner way up. You have to do that. Part of being in the music business is adapting to situations like that. You just have to go in and pretend it's Christmas time. When we did the DVD, we had a big, long stage and we put Christmas trees and Christmas decorations up there. When it's 80 degrees outside and you walk inside, into a Christmas scene, you're able to get into that -- if not into a Christmas spirit, at least into a Christmas frame of mind. So it worked out well." Even at 73 years old, Charlie remains one of the busiest artists on the road. He and his famed band played their annual Christmas 4 Kids concert at the Ryman Auditorium recently. The sold-out event featured Chris Young, 3 Doors Down's Brad Arnold, Phil Vassar, Montgomery Gentry, Gretchen Wilson and the Grascals. Fans who show up for Charlie's shows throughout this month can expect him to incorporate Christmas songs into his show. "Right after the first part of December we go out and we have shows that are billed a Christmas show, but if we did all Christmas and didn't do 'Devil Went Down to Georgia' or 'Long Haired Country Boy' or any of the other songs people are familiar with, people would be very disappointed in us, so what we do is intermingle the Christmas songs into our regular music and it works out.It's enough Christmas music for everybody to be called a Christmas show, but they still get to hear the songs that they like to hear." Next up for the musician is the 19th Annual Charlie Daniels Celebrity Golf Classic and Angelus Country Concert, Dec. 4 at the Seminole Hard Rock Hotel & Casino in Tampa, Fla. Trent Tomlinson, Confederate Railroad, 'Nancy' cartoonist Guy Gilchrist and the Marshall Tucker Band are among those participating in the fundraising event.